We have a dream: that all cattle may enjoy fresh dew on the grass as the first rays of sunshine stretch across the meadow. We believe happy, healthy animals make the best tasting, highest quality meat, which comes from a lifetime of letting cows be cows. Sunshine, fresh pasture, and consistent movement all contribute to the strong, active immune systems of our animals. 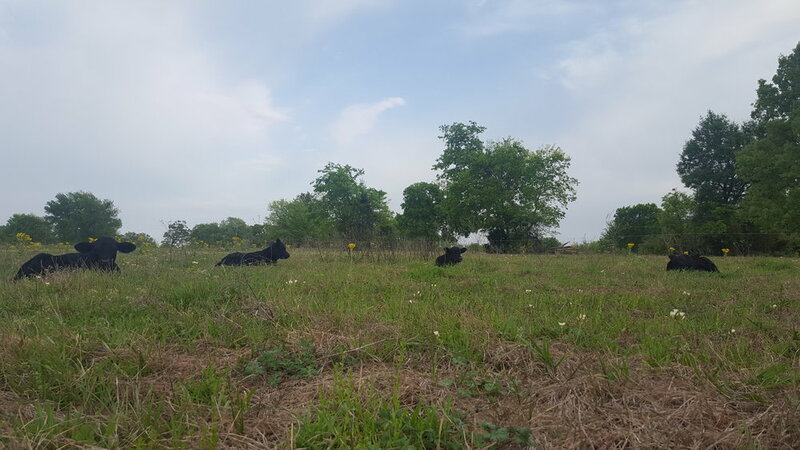 We offer grass-fed, grass-finished, Angus beef, raised with humane, organic practices, from birth to harvest, on our own Bermuda-gone-native pastures, off Highway 47, between Canton & Mabank. Our land is never treated with pesticides, herbicides, fungicides, or synthetic fertilizers, and our cattle never receive hormones, grain, or antibiotics. In other words, we let nature be our guide in managing our animals. 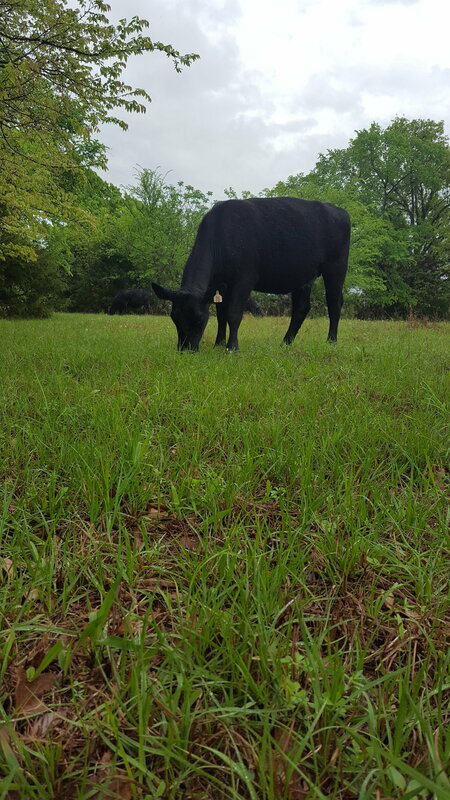 Our grass-fed, grass-finished 2-year-old steers and heifers are finished by weight and conformation with off-farm alfalfa hay and our own toxin-free pastures. Our steers usually finish at a live weight of 1,200+ pounds and a hanging weight of 650+ pounds. Final hanging weights are taken by the butcher. Although we no longer pay for certification, we continue to comply with the HUMANE standards of The Global Animal Partnership (globalanimalpartnership.org) and GRASSFED standards of The American Grassfed Association (americangrassfed.org). Your beef can be cut to your specifications or come as all ground beef. Payment is half upon order, remainder upon pick-up. We will have whole, half, and quarter beeves available at wholesale prices in Summer, 2019, upon reservation. Individual cuts are available, at prices between wholesale & retail at the farm anytime, and at the Rose City Farmers’ Market in Tyler, April through November.